Elsewhere in this issue, Dr. Jim Wright describes the impressive medical career and accomplishments of his friend and colleague Dr. Peter W. Houck: physician. 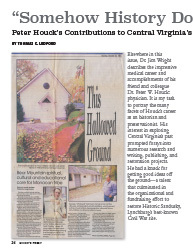 It is my task to portray the many facets of Houck’s career as an historian and preservationist. His interest in exploring Central Virginia’s past prompted forays into numerous research and writing, publishing, and restoration projects. He had a knack for getting good ideas off the ground—a talent that culminated in the organizational and fundraising effort to restore Historic Sandusky, Lynchburg’s best-known Civil War site. Given his devotion to pediatric medicine it should be no surprise that Houck’s historical endeavors actually began in his examining room. He noticed that several of his young patients had high cheekbones, copper-colored skin, and straight backs—physical traits often associated with Native American ancestry. He questioned the children’s parents, but they were reluctant to discuss their heritage or provide any explanation. Gradually Houck established a rapport with these families, slowly drawing out their extraordinary recollections as surviving Monacan tribal members. Peter Houck was always able to create relationships with his patients and with anyone else he felt would be interested in his projects. Retracing the steps of Amherst County’s Monacan people became his first historical expedition. Characteristically, Houck just got into his car one day and drove up to the mission on Bear Mountain in Amherst County to see for himself the place his patients were calling home. There he met Captain John Haraughty of the Church Army who was employed by the Episcopal Church to manage the missionary efforts on Bear Mountain. Captain Haraughty was engaged in improving health care for the Monacans and seeking ways to provide better housing. He welcomed the doctor and made mission records available for research. Houck met families who were not in contact with his medical practice and soon realized that the majority of Monacans lived away from Amherst, dislocated by persecution, discrimination, and vanishing economic opportunities. Much of their story was contained in church files, and he gathered more from the residents themselves through interviews. Their history needed telling, and Peter Houck rose to the challenge, documenting the incredible experience of the Monacans. He titled the book Indian Island in Amherst County. Radiating pride over his new manuscript, he took it to Charlottesville in the hope of having it published. The University Press of Virginia turned him down; they were not interested in the story. He was very disappointed but, undaunted, decided he would print it himself. Indian Island appeared in 1984, published by the “Lynchburg Research Company,” Houck’s alter ego. The book was greeted with mixed reactions. It was a very controversial narrative, with many dark chapters that reflected poorly on Amherst County and, on a larger canvas, the Commonwealth of Virginia. Academics felt that the doctor should stick to medicine and not meddle in anthropology. They missed the point. 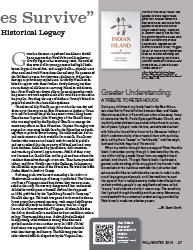 Indian Island succeeded in supporting tribal awareness among Monacans and sparked outside interest in their story. In 1988 a Tribal Association was organized to help Monacans reconnect with their heritage and history. The following year the tribe received official recognition by the Virginia General Assembly. Sadly, the Monacans still await that recognition from the United States Government. Indian Island was expanded and reprinted in 1993 with the help of Amherst County native Mintcy D. Maxham, then a graduate student in archaeology at Pennsylvania State University. If Peter Houck never undertook another historical project, his legacy would be secure in Indian Island—but that wasn’t his way.